Uncategorized | "Just Pray NO!" Ltd.
Tracy was the first person in the State of Illinois to be arrested, convicted, and sent to prison for the knowing attempt to transmit the AIDS virus. How could this happen? Tracy grew up in a middle-income home in Rockford, Illinois. But Tracy made choices early in her life that would have a direct effect on her life in the future. She began to use alcohol very early. In high school, she listened to peer pressure as friends introduced her to drugs. At seventeen, she quit school and took to life on the street as a prostitute in order to earn money for her growing drug habit. Tracy was arrested by Lt. Jim Mays in a prostitution sting operation. Lt. Mays was instrumental in Tracy’s decision to put her faith and trust in Jesus Christ. As a result, her life completely changed. However, the years of substance abuse and the complications from HIV infection were taking their toll. The Governor of Illinois later granted Tracy a full pardon so that she could come home to die. But she didn’t die, and Tracy used her last months to reach out to young people. 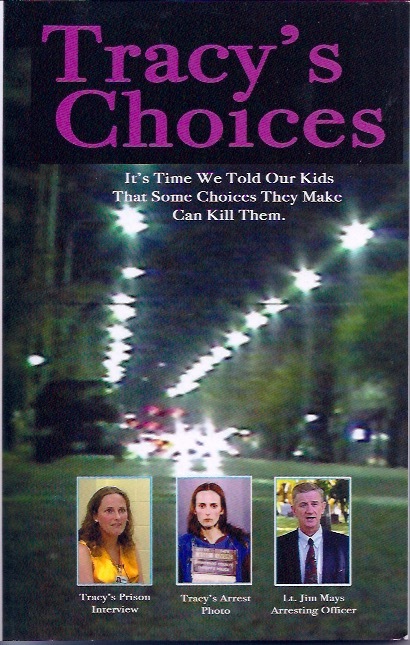 Tracy’s Choices illustrates the point that there may be many forces at work trying to get a young person off track, but in the end, You are Responsible for You.